Below are the most popular PDA phones. For a full range, please see what the brands have to offer such as Apple iPhone, Blackberry, HTC and Sony Ericsson. You can also see the full range of Android Mobile Phones with an explanation of the Android OS. The BlackBerry Curve 3G is the latest curve by Blackberry. The 9300 / Curve 3 allows you to connect easily to FaceBook, update your Twitter account or just send message to your friends via BlackBerry Messenger, and of course emails. The dedicated media keys on the Curve 3G / 9300 let you relax to music or get engrossed in a movie quickly and easily. The BlackBerry 9700 "Bold2" is an incredible handset fit for business and pleasure and makes short work of downloading email attachments, streaming video or rendering web pages. A "best seller". The HTC Wildfire is the smaller version of the hugely popular HTC Desire - it runs the same version of Google Android so you get all the same functions at a lower price. The screen has a web browser comparable to the iPhone, and you get 7 home screens to place your favourite widgets to Facebook, Email and more! The Apple iPhone 3Gs is an Internet communication device with email, web browsing, video recorder, maps, and internet searching, all packed into one small and lightweight handheld device. The large hi-resolution display on the HTC Desire makes it perfect for watching movies. Support for popular movie formats and the brilliant 3.7" display utilizing the the latest AMOLED (Active Matrix Organic LED) technology to produce sharp vibrant colours and deep blacks. Everything you could desire for a business and entertainment handset. Entertainment is not compromised on XPERIA X10 mini pro. Enjoy amazing multimedia with the 2.55 ” high resolution touch screen and DVD quality and take advantage of the 5 megapixel camera to capture and instantly share experiences with friends and family. Blackberry 8520 is a quad-band 2G phone designed with the younger user in mind. 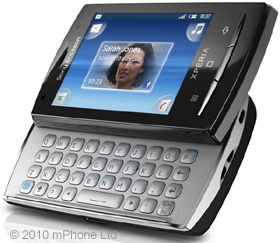 The Blackberry 8520 will support mobile access to both Facebook and MySpace, as well as offering the usual email and messaging services. Ideal as a first Blackberry device. HTC Touch2™, built on top of the most advanced Windows Mobile platform, makes everything from getting in touch to getting online easy. With this mobile, you don't choose a phone, you choose to take charge of your life. The Nexus One is an internet ready mobile. Zip through the internet with 3G speed, a Flash 10 ready HTML browser and super fast processor. View it all on a huge display with touch gestures, double tap, pinch and zoom and see it all.